The Orange Grove Adult only holiday apartment is a very rare find in this area where most one bedroom holiday accommodation is often a little box in a new concrete jungle. Here you have peace, charm and plenty of outdoor space away from the crowds and noises of a complex, but only 5 minutes drive to Vera with it's bars, restaurants, supermarkets and banks. The half tiled single story, self catering garden apartment is approximately 45 square metres and has one large double bedroom. The modern kitchen is equipped with a fridge freezer, gas hob, and microwave with grill, toaster, kettle, picnic cool box and also access to a washing machine. The sitting area has leather reclining chairs to enjoy English satellite TV, and Spanish digital freeview, DVD with large movie library, iPod/iPhone dock and wireless internet. 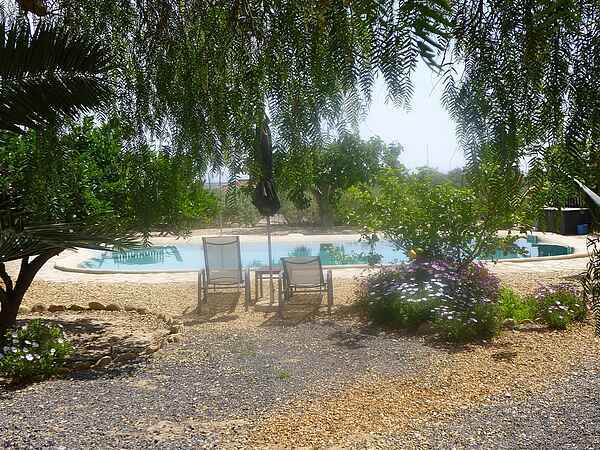 You have a lovely view of the swimming pool through the false pepper tree and orange trees. Outside you have a patio area with table, chairs and a barbeque. Ideal for relaxing at the end of a long day doing nothing!